After we had a timer in various forms. For example : the RC circuits or using IC generat and frequency divider. This time we try to run some microcontroller IC. The advantage of it is that we can assign different effects to it, and many other applications. 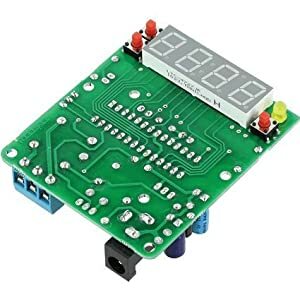 So we recommend take a look at this Digital timer controller according to your needs or not. -Set the time from 0-99 seconds or 0-99 minutes. -There is EEprom-IC helps to keep the program, without the need for power supply. – Can be added or Delete times. At set the time. – Used with other devices such as vending machines, etc. – Show the times while the countdown set the time. As Figure 1 When 12 volts DC voltage into the point DC in 12V next wire is connected to a bridge circuit (D1-D4) which them is used to protect the voltage supply backward. Then there is capacitor C1 filter voltage for stable up, and The rectified voltage will be divided into two-way. First way into the relay RY1 and second is applied into IC1(LM7805) to reduce voltage down to +5 volts and constant voltage fixed at 5 volts for apply all parts in this circuit. 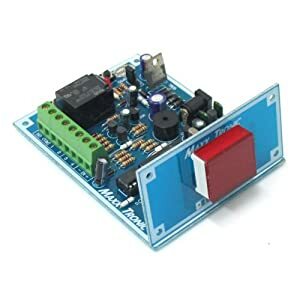 The heart of this circuit is the IC2(PIC16C56) acts to set to working with the oscillator circuit on RC form at port B of IC2 (pin 6- pin 13) will acts Two characteristics are: (1.) the output for control the display of the seven segment LED by has R11-R18 for limit current to the 7′ Segment. (2) The other as input form by will get a value from switch SW1 – SW3 To perform various functions defined. The port A (pin 17 – pin 18) will control common of the 7′ Segment by through Q1(C9012) and Q2(C9012). IC3(93C46B) will a data storage that program while in normal time. The data will not be lost. The IC3 is a Eeprom IC, the data is not lost, though there was no power supply circuit. When we press the switch SW1, will make Q4(C9012) start, the voltage of 5 volts will flow through to pin E and pin C of Q4, through D7 and R22 go to pin B of Q3, result Q3(C1815) operating. At pin 11 of IC2, the original have conditions is “High” so is changed as “ low” immediately. IC2 starts counting down indefinitely. and LED 7 segment display time backwards again. While pin 2 of IC2 will send voltage to bias the Q5(C1815) works. As a result, the relay RY1 with LED1 lights up. When the end, or press switch SW2 LED 7 Segment displays a number 00 on the relay stop at the end of the set time. If press switch SW1 again will start counting new cycle one at point IN and OPTO1 will as option In case you want be used with external devices. The functionality of the software. A software of the PIC16C56-IC2 PIC micro controller is divided as 2 section are (1) Main program and (2) Memory program. The main program can start with IC2 pull data within IC3(93C46B) out to display with LED 7 Segment. Then program within IC2 will check the pressing switch SW1 (Start), if the switch. IC2 will send voltage to pin 2 of IC2 to makes relay RY1 works. Then Timer will divide the inside time that setting and counting within until is zero(1 second is equal to zero on fitted) Then check the mode in minutes or seconds. If the seconds the minutes until it is reduced to zero. Also ordered the relay RY1 stop. When we do not press switch SW2 (Mode) button for 3 seconds, it returns to the main program. If the push switch SW2 (Mode) button for 3 seconds. Then LED 7 Segment Display will show the letters F1. For in mode F5 to extra than other modes. as described above when the press SW3 (Set). The program will pull all the data stored on the Memory of IC2. In the F0 mode will exit Memory program. If you press SW2 (Mode) instead, it will return to F1 in the new mode. This circuit can be built by the PCB as shown in Figure 2, all devices on the PCB assembly so easy. IC2 must be programmed before use. Timer Switch 0-99 Sec/min (With Time Adding).